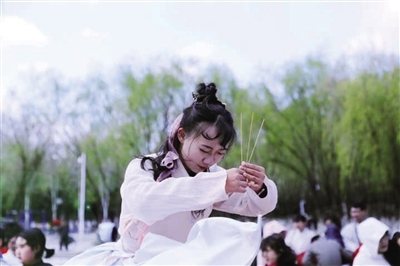 A cultural event featuring hanfu, or traditional Chinese clothing was held in Hohhot to celebrate the Hua Zhao Jie, also known as the traditional Flower Festival on April 6, drawing crowds of hanfu-wearing enthusiasts. The event commenced with a ceremony to honor the flower goddess. Some young women in hanfu performed a series of rites, including presenting incense and flowers to the flower goddess, and to pray for good luck. “It is our first time organizing this event to celebrate the Flower Festival. We hope that the event will be a window for the general public to know more about hanfu,” said Yuan Ziwei from a hanfu workshop during the festival. Hua Zhao Jie, a day to celebrate the birthday of the flower goddess, has a history of over 2,000 years. It is celebrated on the second, the 12th, or the 15th day of February in the Chinese lunar calendar. Apart from worshiping the flower goddess during the festival, people go for an outing and admire the flowers in full blossom.